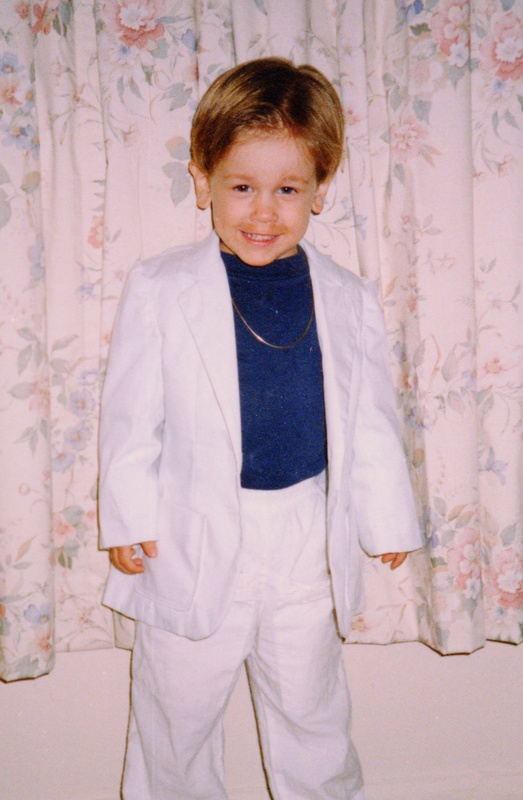 In honor of Halloween and to prove I was an involved mother at least some of the time, here are the pictures I could find of the various costumes Alex wore for Halloween during the years. I know there must be more, but this gives you an idea of my imaginations and/or sewing ability. If you don't remember Don Johnson, here is a very good likeness of that 1980s "Miami Vice" heart-throb. I made Alex's white suit. Notice his gold chain and my attempt at giving him a "5 o'clock shadow." Okay, this one didn't require too much imagination on my part, but it did need my fine make-up skills and my hat. 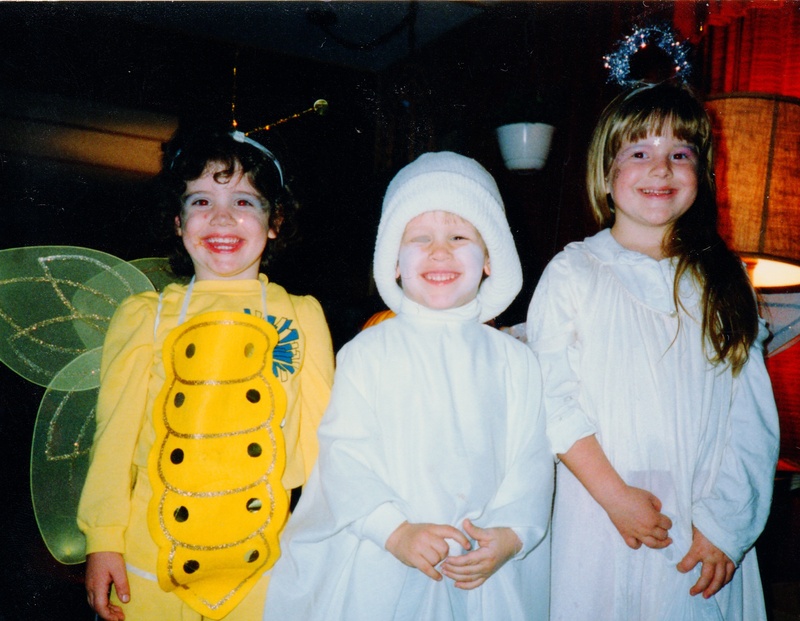 His cousins' costumes were fancier, but I think they're all adorable in their own way. I didn't make this costume, but notice how much better I'm getting with the make-up. As the evening unraveled, so did his mummy get-up. We bought all the gauze in our local pharmacy. They must have thought we were harboring a wounded criminal. Factoid Boy! Truly an Alex original. He came up with the idea and I came up with the costume. A real team effort. 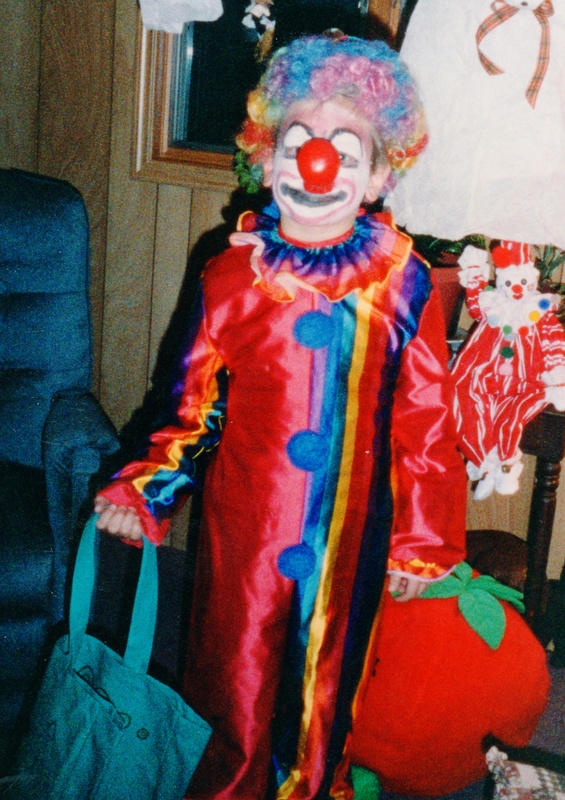 Although not a Halloween costume, Alex used to dress up to dole out candy. This Bike Dude costume was one he used for a school play, Little Shop of Horrors. How about you or your children/grandchildren? Are there any pictures you want to share of your/their Halloween Costume Parade? It was great to collect the pictures and recollect those times. 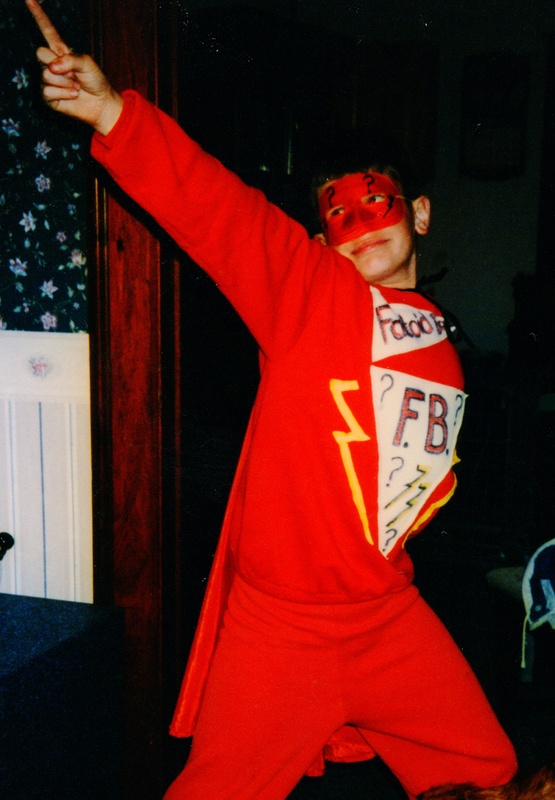 What great costumes and memories of your sweet boy! I love this, Lorna. Some of them were Alex’s idea (like Factoid Boy). My grandmother (Meme of Evil Eye fame) taught me my love of sewing. She never made costumes, but made tiny clothes for our dolls and sewed her own clothes and my mom’s clothes when she was younger. I still have a few blouses she made that I wear–everything old is new again! 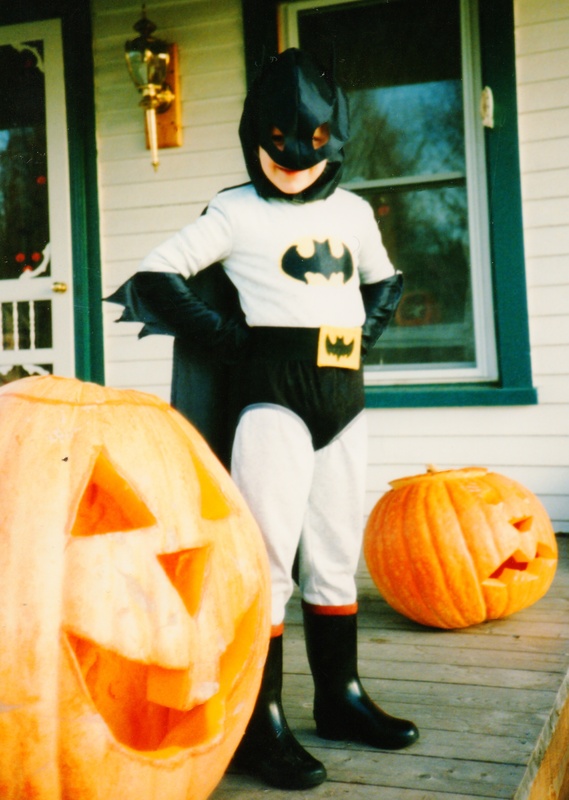 That Batman Costume was A LOT of work, but I’m very proud of it. Thanks! SO IMPRESSED with your sewing skills. I could never make that white suit, or Batman costume. That first picture is the cutest thing ever. Seriously. I out-right awwed at it. I couldn’t help it. My Grandma made some pretty awesome costumes. Like a cat, a pumpkin, a few different coloured crayola crayon options – the list goes on. I totally remember one year using actual ‘antique’ clothing I went as an Amish girl, lol. Actually, my Mom took us and our neighbours out and the boys (or at least one) were dressed up as little Amish boys. I share your sentiments exactly! Yeah, I sewed that. Mask and all. It was quite the labor of love. That Batman costume took a lot of time. Like the wedding dress I made for myself, I’m afraid I only have one in me, sorry Derek! 😉 But thanks for the complement! 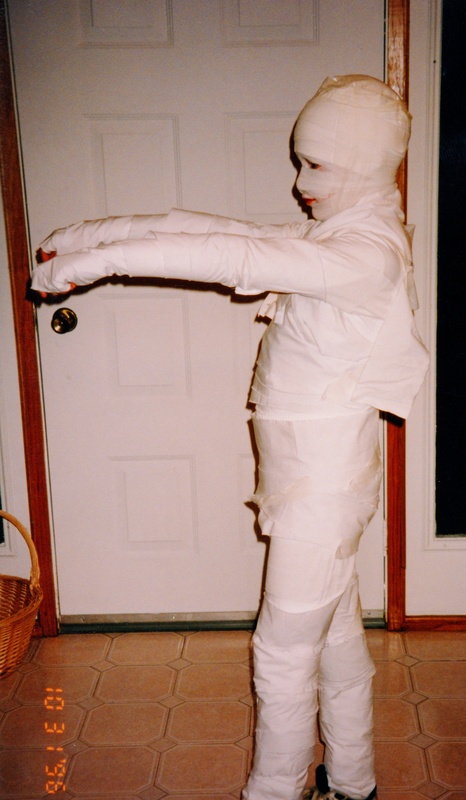 I like the mummy best! One year I blew up purple balloons and pinned them all over a very long shirt – I was a bunch of grapes. Holey Haberdashers! Lorna, that Batman outfit is the bomb! You sewed that? Terrific.